I’ve been a bad, bad blogger. So much has been happening so fast around here I’ve hardly had time to think, much less blog. So, here’s a quick rundown of news. 1. There was one more surprise lamb born about a month after Atlas and Tucker. 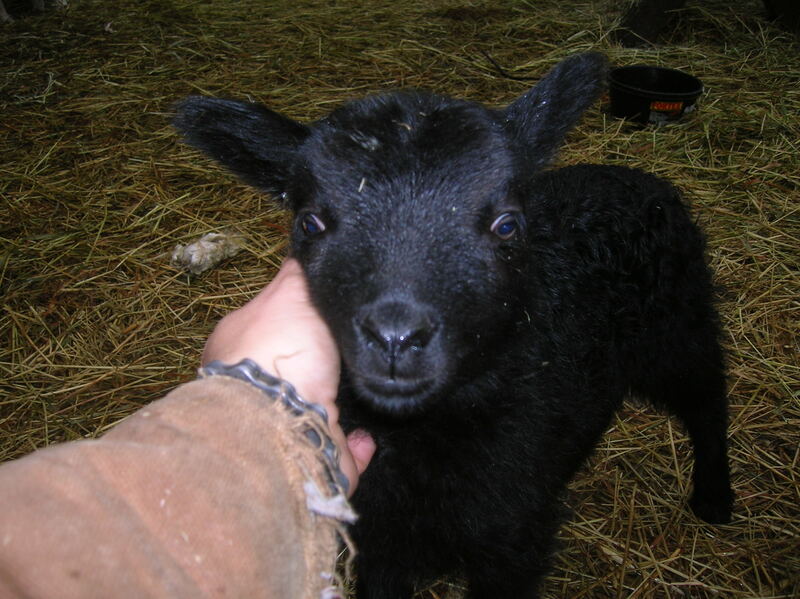 This one was a ewe lamb, from Susie. Her name is Stella, she’s adorable and has a gorgeous fleece. I can’t believe I haven’t shared a single photo of her here yet. She’s 2 months old already, shame on me! So, without further ado, here she is a few days old (born 5/4/12). 3. Another addition to the farm came in the form of a month old shorthorn calf. I’ve been thinking that I would like a cow or two to work as pasture cleaners for a while now. Cow prices in VT have been very high this year, so it was a bit out of reach for me. Until my friend and sometimes neighbor Erika told me about some farmer friends of hers over in NY who she thought would be willing to sell a calf for a reasonable price. She volunteered to check them out while she was over there for a visit. She emailed me a picture of the little guy and volunteered to bring him home to me. 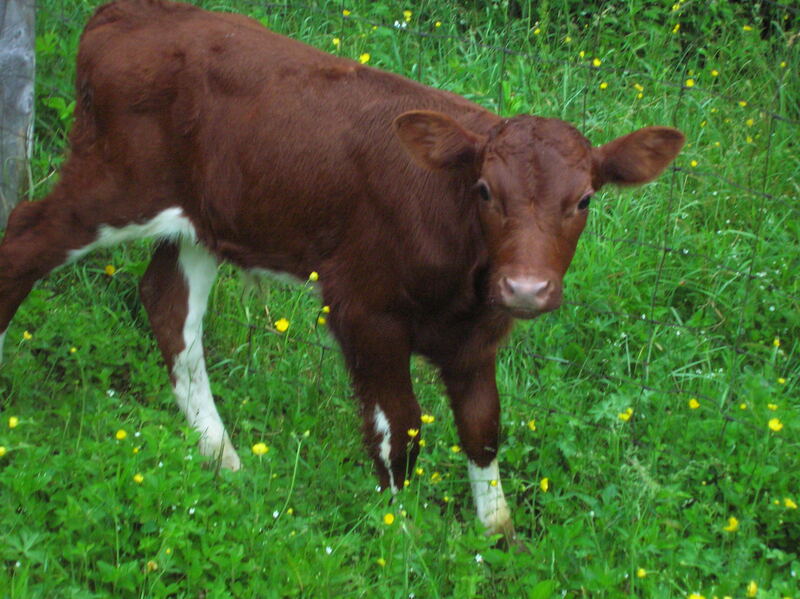 So, now I have a calf. I call him Boo. We’re still working on learning to lead, and he’s still on the bottle for about another week. He’s a sweetheart. 4. Kittens! 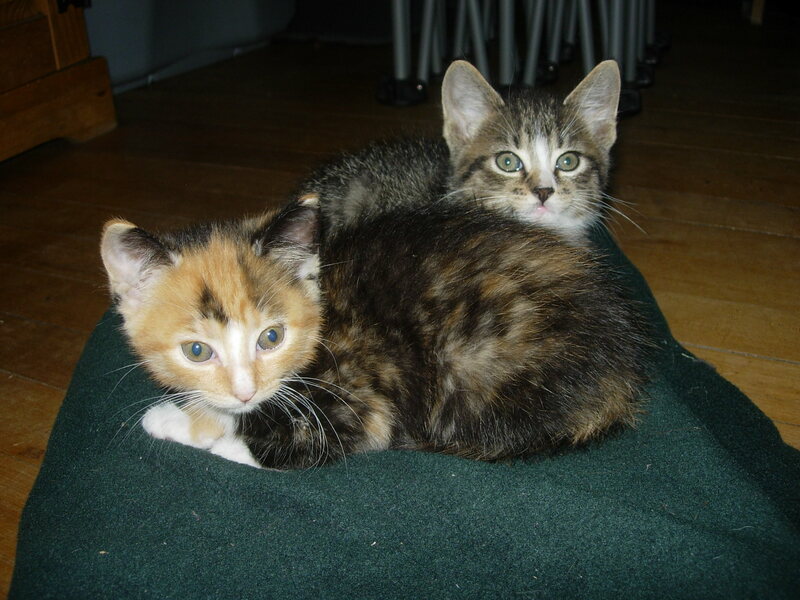 Mice are taking over my upper barn and house, so I have relented and adopted a couple of kittens from my friend Amy. They are a boy and girl, Fred and Ginger. They are currently about 7 weeks old and totally adorable. I’m allergic, so they have been living in the fiber room, with occasional supervised romps outside in the yard. It’s been more than 20 years since I’ve had kittens in my life and I forgot how absolutely hysterical they are. I could sit and watch them play all day long. Their mama is a great hunter, even clawing her way in thru the screen window to bring a chipmunk in to her babies while I was picking them up at Amy’s house, lol. I’ll wait til they get a bit older and larger to move them out to the barn permanently. 5. 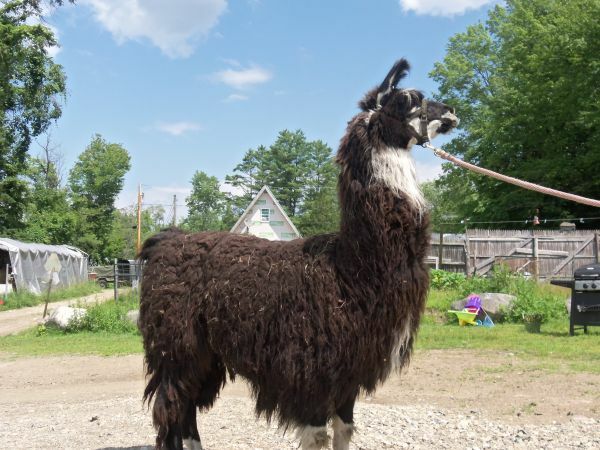 And one last farm addition…just yesterday I got a new guard llama! He’s a handsome, mellow dude. My neighbor and fellow shepherd saw the listing on craigslist and alerted me to him. I called right away, borrowed a trailer from my boss’s wife, and John and I went up to Dalton, NH yesterday to collect him. He’s in the barn alone at the moment while we get to know one another, but I’m looking forward to introducing him to the flock in a few days. Today we are working up to going out for a walkabout. He’s as yet unnamed, but I hope we can come to a decision on that soon. 6. The most amazing and crucially important new addition to the farm this spring is fencing! 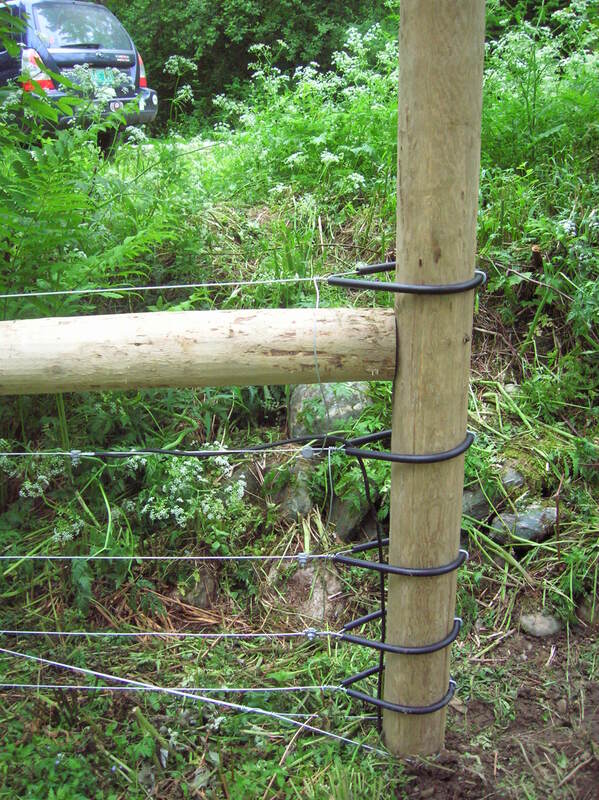 Real, serious fencing. With the help of a few amazing farm supporters I was able to have two of my three pastures perimeter fenced with 5 strand high tensile fencing! This is a huge, huge, HUGE deal! Along with the new fencing came an 18 joule charger, so all that new fence is HOT! I can run all the perimeter fence and as much interior fence (for rotating pasture and ensuring that they really clean up the areas) as I want. So, the flock has been moved over to my far pasture and they are busy cleaning up that area. I started them out there last summer, moving them around in net fencing every couple of days. The areas where they grazed last year came back with about 50% more grass this year, so I know that in a couple of years that old overgrown pasture will be nice grass again. For now, I still supplement them with some hay in the evenings and grain in the mornings to ensure that they are getting proper nutrition. The other bonus to having them out there is that there are few parasite larva and eggs out there, so I’m not having the parasite issues this year that I did last year. Hopefully the introduction of Boo (and hopefully I’ll find him a friend or borrow a calf from a neighbor) and my neighbor’s draft horses to the pasture rotation will help keep the parasite issue to a minimum. Future shepherd Arden loves to come visit and hang out with the flock. His current favorite is Blue. Wow you are growing in so many ways. I wish I could get a cow myself but I have not room. 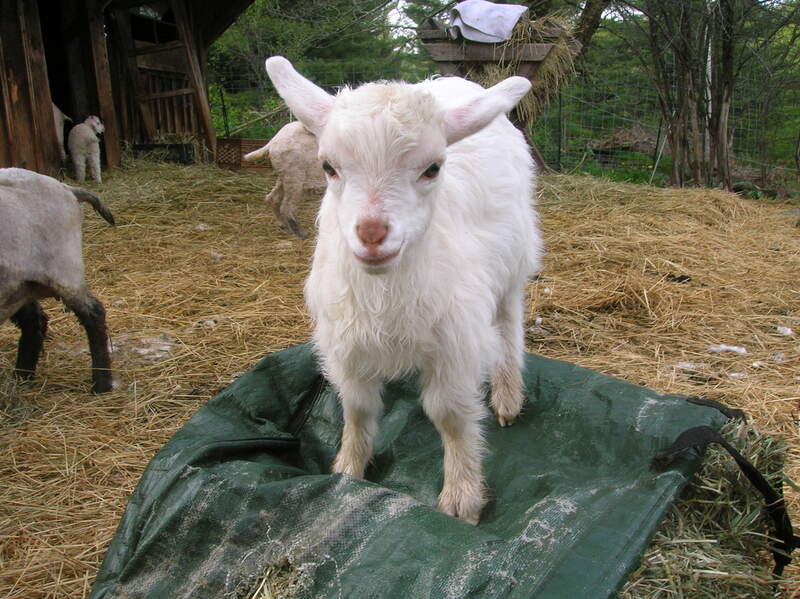 We have been growing too but we are hoping to breed some this fall for more goats. 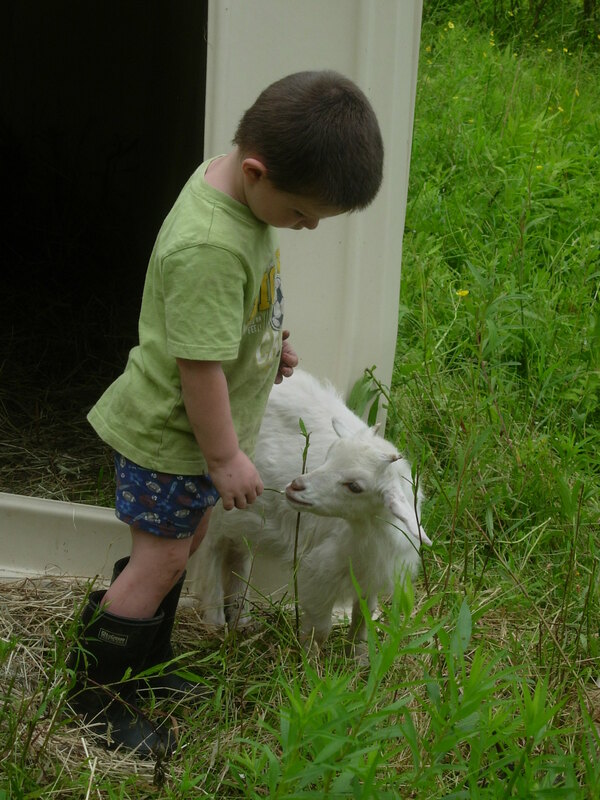 We have added 45 chickens, 2 pigs and 2 sheep this year. Hi Tom! You’ve been on my mind a lot this summer with all these crazy storms. What kind of sheep did you get? Hope all’s well! Your new family members are beautiful! Congrats to all…..
Awwwww they are super adorable! !